This gorgeous glacial koi fish has matured into a radiant adult. It possesses powers over fresh water, and a faint blue glow can occasionally be seen in the water around it. A powerful tail makes for great speed and nimbleness. When the water around a koi has changed in color, the glacial koi fish has cast some enchantment on the water around it. Minor powers such as healing and charms for relaxation are a koi's specialty, and these mild creatures love assisting all who ask. Glacial koi are often seen caring for their young and watching over the animals that share the lake with them. Glacial Koi fish are gentle, patient animals, found in rivers or streams, though they can travel to most bodies of water. They are graceful and lithe, covered in beautiful blue and green scales. Graceful and full of healing powers, glacial koi fishes are generally overlooked, but their magic, though subtle, is extremely valuable. 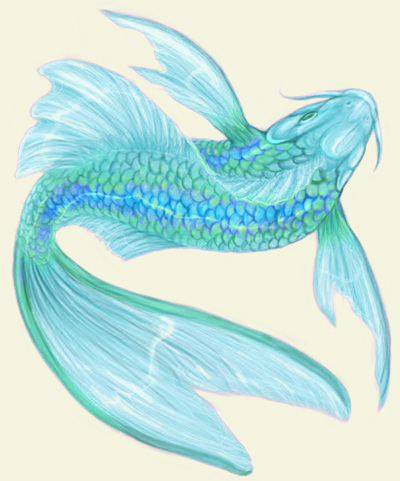 The owner of any such fish will find, if they swim with their sweet pet, that the glacial koi fish enables the master to breathe under water for short periods of time. This aids a magi greatly in searches for rare eggs beneath the waves.